Plans have been submitted for a new 10-story downtown Asheville structure called the Parisian Residences that would include a parking deck, 39 residential condominium units and 16 hotel units. 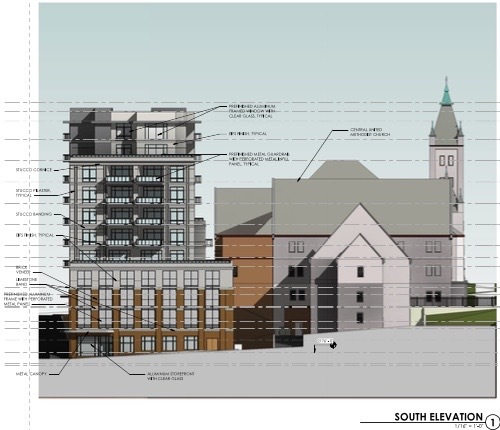 The proposed location is along Buncombe Street on the South Slope, the current site of a surface parking lot. The developer submitting the drawings is the same developer who last year won approval for plans to build a boutique hotel on Patton Avenue called The Parisian. 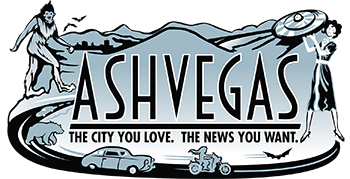 Parking at the Parisian Residences would serve as parking for The Parisian hotel, under the plan, city planner Sasha Vrtunski told the Asheville Downtown Commission at its June 8 meeting. Plans had not yet been submitted at that time, she said, but that was her understanding from discussions. In addition, plans for The Parisian have changed, Vrtunski said. Back in February 2017, MRK Property Development won approval of its proposal to remake the former Bank of America building into a six-story, 61-room boutique hotel, which would require the addition of three stories to the building. Now the plan is to keep the building at its original height, or possibly even lower the height, and have just 45 rooms, she said. The Parisian Residences is scheduled for its first regulatory review by the Asheville Technical Review Committee next month. It must eventually go before Asheville City Council for final review and consideration of approval. I have to agree that Green Man is less than stellar. Beyond that, you guys don’t know anything about architecture. You don’t have a clue what’s good or what’s bad. You basically don’t like anything and want all new buildings in Asheville to look like they’re from 1920, back when buildings had “character”. I don’t mind contemporary architecture at all, provided that it’s not Charlotte Boring. Asheville has some excellent contemporary architecture, although almost all of it is single-family homes. All the big projects, and all the new projects downtown, are just Charlotte Boring — trite, of cheap beige materials, and forgettable, and contributing absolutely nothing to Asheville’s rich architectural tapestry. The only new building downtown that even comes close to breaking free of Charlotte Boring is the BB&T bank that’s part of the Hilton Garden Inn complex. I actually like the Mission parking garage that curves from Doctors Drive to Biltmore Ave, which is as close as Asheville gets to full-on Brutalism. I’ve also been watching the new faux-deco exterior go up on the “Arras” and it’s like a terrible Halloween costume. hauntedheadnc is right that innovative and attractive design in this area seems limited to residential projects, probably because the people who pay for them have to live in them. Everybody else gets beige boxes with pastel or brown accents that look like they were modeled by gluing together shoeboxes. Parking, Parking, Parking. These developers need to invest in their cities and parking must be addressed, put in more than you need. Love the concept!! Okay, so it incorporates actual residential units — which under current city law I assume would not be used as glorified STR hotel suites — and it replaces a surface parking lot. Likewise. I’m not massively impressed with the “stick a Charlotte Boring box on a faux-old parking garage” approach and it was their development team that wanted Buncombe HHS moved from downtown, but it’s using surface lot space for the former Asheville Savings Bank, now First Bank, that was never really used by customers and more popular with tow trucks. Central UMC may hate it. That’s kind of the fate of old downtown churches built before skyscrapers. But there might be a legitimate question about whether excavating the foundations for a 10-story building could affect its structural integrity. I think construction vibration can be mitigated, but I agree with you that modern architecture in Asheville is distinctly unimpressive. It’s like there are mediocrity standards that must be adhered to or something, and those standards dictate beige brick or beige fake stucco or else the developer must pay a hefty fine. Almost everything that has been built downtown in the past twenty years is of the Charlotte Boring style of architecture. I refer to these buildings as something you would see near an airport. And while that may be true, the proper name for the style is “Charlotte Boring,” after the multitudes of such buildings which infest that unfortunate city. The hallmarks of Charlotte Boring architecture are the forgettable contemporary style, failed attempts at character with trite embellishments such as the “oatmeal can” corner tower, and vast expanses of either beige brick or beige fake stucco. The effect is akin to a new apartment, with its beige carpet and putty-colored walls: expressly designed to be bland so as not to clash with anything. Sadly though, this probably for the best because, on the rare occasions a Charlotte Boring building makes a stab at real character or noteworthiness, you only end up with an incoherent splatter of styles and elements, such as the Green Mansion of Green Man Brewing. That building looks like the builders accidentally used the architect’s five year old’s drawing to go by instead of the actual plans. If given the choice between pure Charlotte Boring, such as the Hilton Garden Inn versus something like the Green Mansion, I’d have to hold my nose and take the Hilton Garden. We don’t need anymore building of “affordable housing” or any other types of condos, apartments. The town is ruined and has too many people moving here. Sounds like a plan. Now, considering that people aren’t going to stop moving here, how do you propose we ban new housing without immediately tripling the price of every existing housing unit? Joy, when did you move to Asheville? Or are you one of those rare natives? Because if you’re not a native, don’t go talking about people moving here.